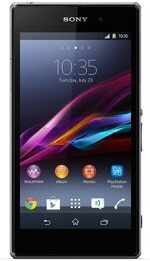 The Sony Xperia Z1 is a high-end 4G LTE handset that features NFC, a 2.2GHz quad core Qualcomm Snapdragon 800 processor, 20.7 megapixel camera and a 5-inch full HD display. The fully waterproof device runs Android 4.2.2 Jelly Bean and will come with Social Live, a new feature allowing the user to broadcast video straight to Facebook. The Xperia Z1 was announced on 4 September 2013 and became available later that month.